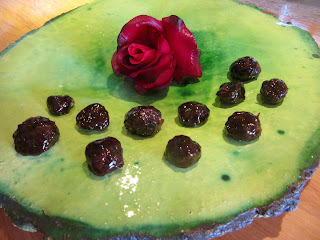 Remove enough rose petals from the buds to layer an earthenware dish. Wash and let drip dry. Fill a bowl with ice water. Drop small amounts of the mixture into the bowl. They will form little balls. Remove from water and let cool over parchment paper. If not available paint plastic wrap with oil and place the candy on this. Eat like nuts during meals. As it must be sucked, it is an excellent way shut up those who chatter too much! It elevates stomach and liver problems as well as dropsy in the lower abdomen. It also moderately helps body-building, if it be God’s will. Due to lack of rose pedals the recipe was reduced to 2 oz rose petals and 8 oz/2 c honey.